It should not be surprising any more when a mobile game gets ported over to a Nintendo platform. It happened with high-profile smart device mainstays Angry Birds and Cut the Rope, and we've also seen it with several lesser-known games as well. The latest title to continue this trend is the massively popular tile-sliding puzzle game 2048 and, once again, it feels like a perfect portable fit on the 3DS. 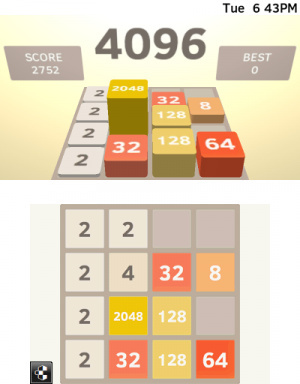 If you're unfamiliar with 2048, a quick history lesson is in order. This addictive puzzler was originally a browser game that was later ported to iOS and Android devices, a familiar path that many games follow today. Despite both its simplicity and seeming originality, it is actually a slightly altered clone of a game called Threes! which had released on iOS devices a month prior. 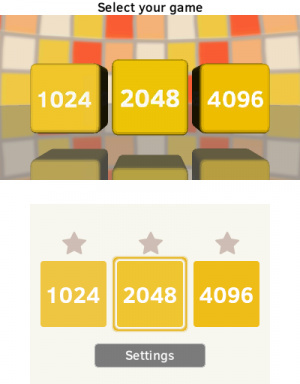 Differences from its very new predecessor aside, 2048 took a lot of flack from the gaming community derived from both displeasure with its obvious source and the fact that fans were playing this game and remaining completely unaware of the existence of Threes! in the first place. Moral grey areas aside, 2048 is still a worthy addition to any puzzle fan's collection, especially in the absence of Threes! on the 3DS eShop. 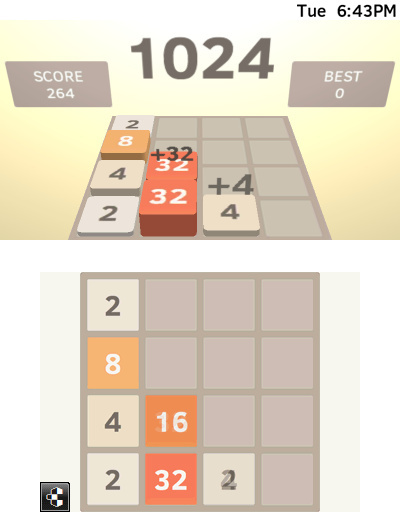 Drawing influence from sliding puzzles, the goal in 2048 is to move numeric tiles across a 4x4 grid and combine them into increasing numbers. The game starts out small, beginning with tiles marked with 2 and 4, but once you start matching and combining, the numbers increase exponentially. Each move that you make causes every tile on your board to slide in the direction that you send them and a new tile to appear. Your goal is to keep sliding and building larger numbers to increase your score, but it's all over when your board is completely filled and you've locked yourself into an unmovable position. There are three games to be played – all of which have the same gameplay and board but require different scores to be reached in order to complete – and several achievements to unlock. Truthfully, no matter which mode you play, it's always the same concept and these extra options are little more than a façade to give an otherwise straightforward and shallow game a little more depth. The game may be based around numbers and multiplication, but it's really just about matching tiles. Because of this, what would seem like a complicated endeavour actually makes for a very user-friendly experience that is accessible to gamers of all ages. The controls are also very accommodating, allowing you to use the console's D-Pad, Circle Pad, lettered buttons, or even the touchscreen to play. This isn't the type of game that requires any precision or speed from its inputs, so any control scheme that you feel comfortable using works just as well as the next. As 2048 can be controlled using touch – not unlike on its original mobile format – the game board is displayed on the 3DS's bottom screen. The same board is also reflected on the top screen, but it instead boasts an isometric view that makes use of the console's 3D display. The top display adds life to the otherwise flat and exceedingly bland visuals, but it also tends to overcomplicate things. As your numbers increase, the blocks that they rest on grow taller. This provides a helpful visual to help illustrate your growing score, but it also hinders your vision by blocking the tiles that lay behind. It's refreshing to see a developer take an otherwise stale element of its game and try to give it more appeal, but in this case it ends up being more of a hindrance than anything else. There's not much else that can be said about 2048. The experience is shallow, but that doesn’t mean it’s not one worth having. It's a very modest game that revels in its simplicity and thrives on its addictive nature. This is the type of game that, even after missing the high score 10 times in a row, it’ll still have you saying "just one more try." 2048 isn't the most exciting or visually stimulating game on the 3DS eShop, but it does provide some of the most satisfying pick-up-and-play action around. As a highly successful mobile game, it'll come as no surprise if most players have already given it a try, but those puzzle fans who haven't should definitely put this one under consideration. Need something new to do while sitting on the bus, train, or toilet? 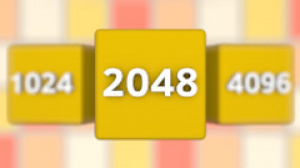 2048 is fun, quick, and just distracting enough to keep you occupied for hours at a time. It may sound rather weird, but...I really think the 2$ are worth it. 2048 is really fun and once you get the knack of it, it's really satisfying when you get higher scores, too. $2 For a Browser game no thanks I can play this whenever I want for free though this is a really fun time waster. This isn't my kind of game, but even if it was I would never give this company any of my money after ripping off Threes! and still selling better. Threes! needs justice! JUSTICE I SAY!!! But seriously, people/companies getting credit for things they didn't do is one of the things I hate the most, unless of course they're humble and make it clear who should really get credit. If you want to play it for free instead, here's the link. Because it is offered for free by the developer if you're playing in a browser. And the concept was so simple. A clone was bound to happen. If you want to come out on top, add more features. Or release it for free with occasional advertisements, with a 99 cent cost to remove ads. I might just pick this up. Sure its free on my phone, but I do love me some 3DS gaming and this well, fits the bill pretty finely! Although $2 (£1.40) does not sound much. It is still $2 more than free. Most folks have a smartphone and a finger. This is not what the 3ds is for. I might pick this up. Maybe. As long as it is the same price on both I am ok with it. (Don't agree with different platforms paying more or less). (I have Gunman Clive on 3 platforms even though I have only actually bothered playing the 3DS one I just support the principle). I'd be at least a bit more convinced if it were to support images on 3DS. To be honest, the story behind 2048 is far more interesting than the game could ever hope to be. Why would you pay $2 to play it on the 3DS if the game already works on the 3DS browser? Ah, why bother when i have on my phone for free! Dunno. I have it on my phone, but my phone can't hold much stuff on it. Getting it on the 3DS would free up space... And I have my phone and 3DS on me at all times anyway. It's also not like $2 is obscene. They added 3D graphics and it won't be piled with ads. Seems like a fair enough tradeoff. I might not get it now, but sometime in the future...perhaps. I'd rather not buy a blatant ripoff of Threes. @Noob_The_Third That is the million dollar question! Or rather, the $2 question. And the answer is that you won't always have an internet connection on the go. It's fun enough and cheap enough that I don't think the price tag is a big deal. I'll be getting it tomorrow. The price is still less than I tip my baristas every morning, and unlike most people I refuse to get a smart phone until I virtually have no choice. That is to say, when my wife makes me cause she wants one finally. Oh I remember this game, it's that one app I usually see my friend playing that isn't about constantly flicking money to "earn a profit" [I found it so stupid, but never remembered the name of the app]. Gee I dunno, I can play this for free on my phone but it looks like something I can play on my 3DS. I'm addicted to the browser version, and not having a smart phone I snagged this the instant I saw it on the shop, well worth the 2 bucks to be able to play it on the go. Thanks for the link, @steamhare. The achievements make this one kinda compelling over the web-based version. i might be tempted if this ever comes out in Europe. Or wait for a sale since 1,50€ sound like a near perfect price for this on 3DS. Or just spend your money on the original Threes. I'm not a fan of smartphone gaming, but there are so many fun little animations in Threes (and there's the fact that it's the original game), which convinced me to buy it. No need for me as I can play it free on my phone. But if you don't have either a phone or tablet, and to be honest I think most of us do, get this. Definitely a fun little game once you get the knack of it, which I haven't. Tried playing the browser version...could not get into it. I don't understand the appeal despite liking puzzle games. It offends me (especially as a game designer myself) that this game is clearly just a total and utter rip-off of threes and yet these guys have had so much success as though they didn't just steal someone else's idea and then just make it with much sh*tter looking art and style. I know lots of people copy popular games, Christ, I've even made my own Flappy Bird clone (was more just a test for my own sanity), but something just doesn't sit right with me when the cheap cash-in rip-off ends up making probably more money than the original and 99% of people probably have absolutely no idea that it's actually a total and utter rip-off of the game that really should be seeing all the success. Note: It's different when a game is somewhat similar to another game but also does it's own thing and at least has it's own unique spin on things. Imitation is the sincerest form of flattery after all but blatant plagiarism is just blatant plagiarism. 7?? This games deserves a very solid 9! This is a ripoff of Threes, and that deserves to be repeated. It's true that lots of games riff on eachother, but this literally came out weeks after Threes hit it big. 2048 is an easier Threes, and people liked that (that it was easier) There's a fantastic write up from the makers of Threes that say they actually considered during development the ruleset that 2048 uses, but decided it was too easy and not interesting enough to play. @Kirk The same situation happened with Candy Crush, isn't that right? Pretty much but at least Candy Crush tried to do it's own style and stuff even if it was just another match three game.